Frankie Cosmos Announce New Album Vessel, Share Sharp Lead Single "Jesse"
New York indie-pop quartet Frankie Cosmos have unveiled their Sub Pop debut, Vessel, set for a March 30 release. Lead single “Jesse” was one of the first songs that Greta Kline and company arranged for their new album—listen below. “Jesse” is a dexterous, dynamic track that finds Kline coping with feeling out of place, striving to get in touch with herself psychically by coming to terms with various dreams and subconscious realizations. The band’s current live bassist Alex Bailey contributes nimble lead guitar, while Kline’s vocals are imbued with confidence, despite their delicacy. Throw in Luke Pyenson’s tight, rapid-fire percussion and you have a bold new Frankie Cosmos sound. 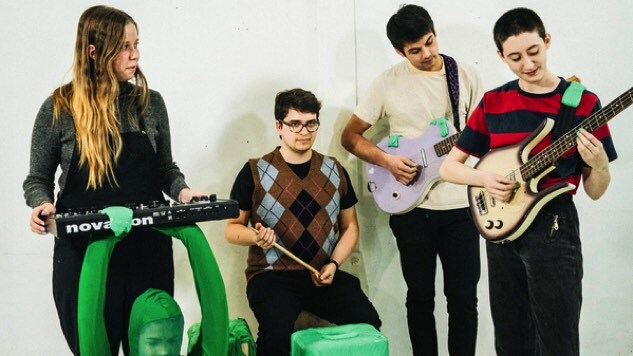 Frankie Cosmos—comprising bandleader Kline, bassist and vocalist David Maine, keyboardist and vocalist Lauren Martin, and drummer Pyenson—signed to Sub Pop in April 2017. Vessel will be their first full-length since 2016’s excellent Next Thing, which we hailed as one of the best records released that year. Vessel finds Frankie Cosmos at their most unified, a far cry from Kline’s early days of writing and recording alone in her bedroom. Per a press release, the album, which is the band’s third release and Kline’s 52nd (! ), features multiple “instrumental first or second-takes, highlighting a newfound collective energy felt by the band’s four members after months of touring, practicing and arranging together.” At a whopping 18 tracks, Vessel is exactly double the length of the band’s 2014 breakout, Zentropy. Kline and company will hit the road for a West Coast-focused U.S. tour supporting Vessel this spring, starting with an April 5 show in Boulder, Colo. Frankie Cosmos, accompanied by Lomelda, Ian Sweet and SOAR, will play shows in Santa Fe, Phoenix, Los Angeles, Santa Ana, Berkeley and Seattle before concluding their run with an April 20 stop in Portland. More dates will be announced in the coming weeks, so if you’re city isn’t included below, don’t fret just yet. Listen to “Jesse” below, and find Vessel’s tracklist and album art further down, plus Frankie Cosmos’ tour dates. You can preorder their new album here.